Universal CityWalk introduces two sweet and savory casual concepts Mini Monster and Poke Bar, adding an all-new delicious dimension to the destination’s latest dining options that already include the popular Jimmy Buffett’s Margaritaville, Ludo Lefebvre’s LudoBird and Dong Po Kitchen. Now open, Mini Monster is recognized as one of the most Instagrammed restaurants in Southern California and features a menu of small-batch flavorfully brewed teas and lemonades, served in California glass jars and specially-designed signature light bulbs. 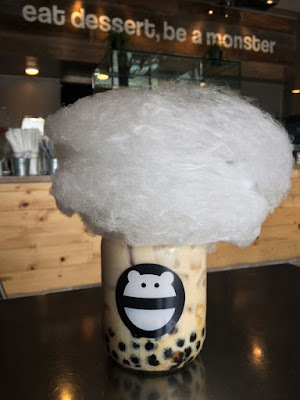 The specialty drinks come made to order with warm boba (black tapioca pearls) and whimsical clouds of spun-to-order cotton candy. In late-August, Poke Bar will serve up a fresh twist on Hawaiian cuisine with build-your-own poke bowls and will feature a customizable menu that includes a variety of seafood including ahi tuna, salmon and albacore, as well as vegetarian options paired with tasty ingredients that range from cucumber salad and crabmeat to seaweed salad and edamame. For over 20 years, CityWalk has boosted the city’s rhythm through a foundation built on providing memorable entertainment experiences. With a series of dramatic enhancements underway, which include the introduction of new restaurants, shopping experiences, visually aesthetic design features and a state-of-the-art multi-million dollar Universal Cinema renovation, the spotlight shines brightly on CityWalk as one of L.A.’s most influential lifestyle centers. More information about Universal CityWalk is available at CityWalkHollywood.com. Regular updates also can be found on CityWalk’s Twitter @CityWalkLA, Facebook page Universal CityWalk Hollywood and Instagram @CityWalkLA. Universal CityWalk is Southern California's dynamic entertainment, dining and shopping destination that reflects the area’s rich cultural diversity. The iconic open-air leisure and nightlife complex provides “Always Unexpected” entertainment options and has served as a prototype for similar destinations. Universal CityWalk includes the high-tech concert venue, “5 Towers,” completely redesigned Universal Cinema, featuring deluxe recliner seating in screening room quality theatres, and unique venues such as Jimmy Buffett’s Margaritaville, Dongpo Kitchen, Samba Brazilian Steakhouse, LudoBird, iFly indoor skydiving and mechanical bull-riding at Saddle Ranch Chop House.